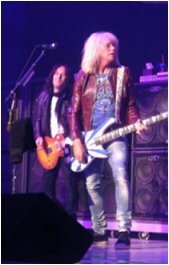 Def Leppard played the third show of the 2013 VIVA Hysteria! residency last night at The Joint in Las Vegas, NV with 23 songs played. Night three saw the band play a 9 song opening set as "Ded Flatbird". This set was full of rare songs and surprises with 5 new songs played. The band opened with 'On Through The Night' and also the (equally) rarely played 'Rock Brigade'. Other additions included 'Rock! Rock!' and 'C'mon C'mon'. The band played the full album once again and ended with the same encore of 'Rock Of Ages' and 'Photograph'.